Even a year after using the KonMari Method, I was feeling the effects like it was just yesterday. I mean after I did the first step of tidying my closet with the KonMari Method I realized the magic. 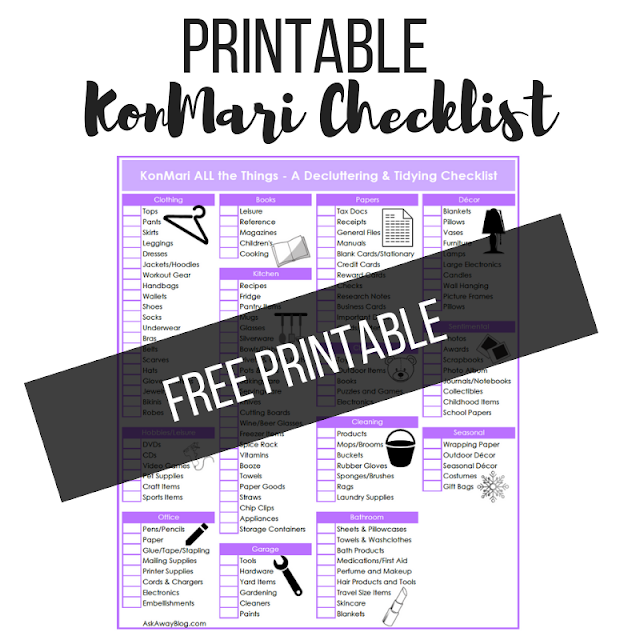 The KonMari Method is named after a sweet Japanese woman, Marie Kondo, who teaches us all how to declutter and tidy our homes. And no, the point isn't to purge everything you own, it's to actually focus on what brings you joy and keeping those items. The key is to hold or touch each item and see how it makes you feel. I know, you're probably like "Um, okay but my ugly lawn mowing sneakers don't bring me joy." But does your home and yard make you happy? Well, the dirty sneakers help to bring you joy because they help you maintain your home and yard. American homes are just so full of STUFF. We get stuff from out parents and grandparents and they seem to be of the mindset to keep ALL THE THINGS even if there's no use for them. It's basically all in your head, I assure you. It seems Americans try to fill up every open square inch of their home. Walls are lined with furniture literally the entire way around the room. Every surface either displays random knick knacks that collect dust and are a pain to clean OR piles of clutter of stuff you just don't feel like dealing with yet. I highly recommend everyone BUY HER BOOK! If you buy her book, she'll teach you her ways. The Netflix special gives you a glimpse at parts of her method but it's NOT a definitive guide to how it works. The book is an easy read, and you'll be eager to begin as soon as you finish. Once you start tidying you will gain momentum. It really feels amazing and I can't explain it other than to tell you to give it a try yourself. This means ALL clothing in every closet for every person. You go through and instead of saying "Will I wear this?" or "Do I wear this? ", you'll ask yourself if it brings you joy. I was skeptical at first, trust me, but when I got to this one blouse that I am constantly adjusting when I wear it because it seemed too low cut, I realized that it doesn't bring me joy. In fact, it stressed me out whenever I wore it to work because I had to worry so much if it was slouching down my chest. Once you have discarded, donated, and decided what to keep - there are so many neat ways to fold the different articles of clothing you're left with. I noticed that her way of folding and organizing items leaves you with more space and it's easier to see what you own. I LOVE my closet now. By the way, it's really eye opening when you have to put your clothing in a pile on your bed. Grace enjoyed my mountain of clothes though! Using books as decor brings me even more joy! The next category is books and if you think about it, books take up A LOT of space. In the paper category this covers ALL the paper around your house. That's right - things like files, manuals, recipes, bills, notes, etc. You may think you need it all but just know that I have a single file box for all of my papers that I must keep and there's no such thing as a pile of papers in our home. Everything gets dealt with right away. 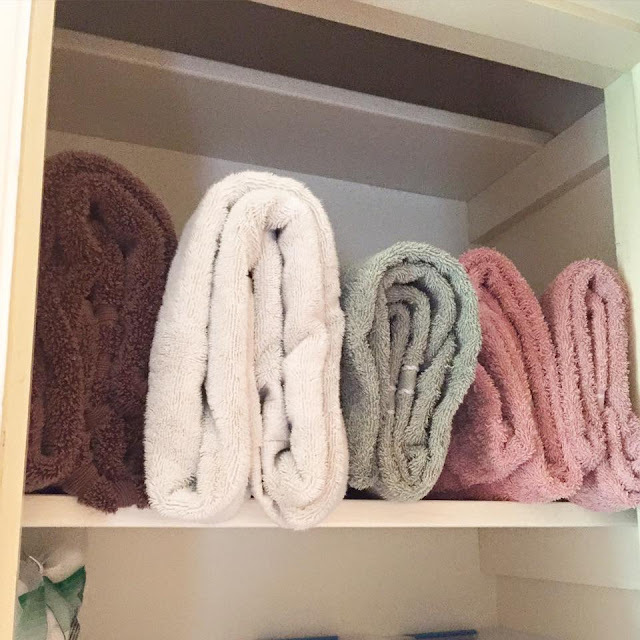 Behold, my KonMari folded towels! Komono is basically the Japanese way to say 'miscellaneous' or ' ALL THE REST OF YOUR CRAP!". This means kids stuff, office supplies, cleaning supplies, decor, storage ,crafts and DVDs, pet supplies, and linen closet stuff. You go through each category one by one and keep only what brings you joy. And if you don't think it's possible, wait till you get all the scissors in your household into a pile and you start asking yourself why in the world you'd ever need 15 pairs of scissors in a 3 person household. Of course this will be the hardest category for some people so Marie saves it for last. Sentimental stuff you find along the way should be set aside for this category. This is when you go through all those bins of stuff you've saved for decades like greeting cards, childhood mementos, photos, etc. But KonMari does not end there. If you are committed to it, you'll notice that random junk and things don't bring you joy anymore because you are more careful with what you value. You may realize impulse buying isn't as much of a problem for you and you'll be apprehensive to buy things you really don't need or have a practical use for. Your wardrobe will spark so much joy for you that you'll LOVE getting dressed in the morning no matter what your body looks like. Occasionally, you may need to go back and redo some categories over time. I've done it too but it's always easy and not as big of a process as it originally was. You'll also realize you want to show off your home more and you'll more than likely influence some friends to do the same. 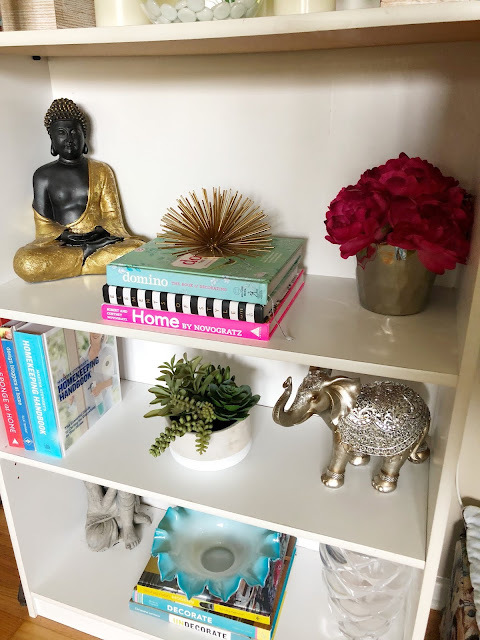 When I lived in a clutter filled home, I felt stressed and was always in a rush to find something or I'd spend money on something I already had but couldn't find. 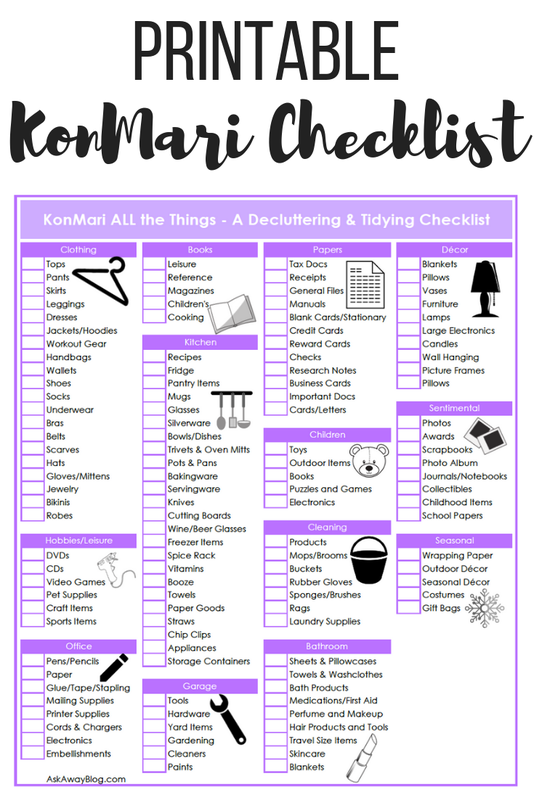 The KonMari Method of Tidying has helped me save money, feel less stressed and anxious, and love myself and my life much more than I ever thought was possible. This closet brings me SO MUCH JOY! 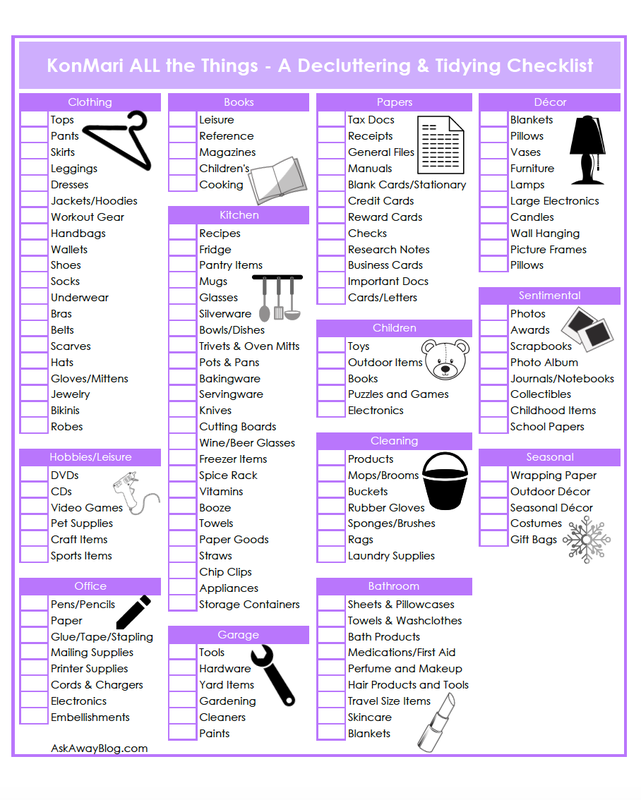 So do you want to get started tidying and decluttering your home? Well, today I have a free printable KonMari checklist for you that I actually made up for myself. You can check off the different items as you complete each one. 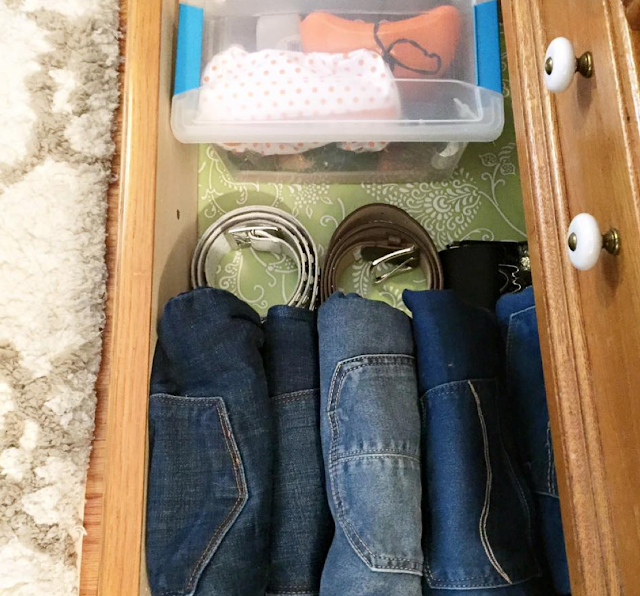 ARE YOU READY TO TRY THE KONMARI METHOD? So going to have use this print out. Seen we are going to be getting ready to declutter our home.